Welcome to our Stamp of the Month BLOG HOP for June featuring Tender Tags (set of 15) which you can get at a great discount or even FREE with order through June 30th! This is a circlular hop so if you keep on clicking through to check out the great art provided by 42 different Close to my Heart consultants, you'll have done the full circle when you come back to where you started! I can't wait to click through and see all the fabulous creations from my sister consultants. We have some serious talent in this company! To follow along on this hop you just need to click on the link at the end of the post on each blog to move along to the next site. Afraid you'll get lost? No worries! The list of all participating consultant sites is at the bottom of this post! Everyone needs a tag set in their tool box of stamps and this set is such a sweet swirly set! I used one of the Tender Tags as a potted topiary tree on this card with the "Rock and Roll"technique. I started off with Sweet Leaf ink and inked up the entire stamp, then I "rocked and rolled" the edges of the stamp in Topiary ink and then stamped on White Daisy Cardstock. Tiny Cocoa CS pots finish off the look. The little bird is from the April Word Puzzle stamp set. To get her pointed in the right direction, I stamped her and then cut her out, flipped her over and then decorated the "back side" with chalks (to get the blue body and yellow beak and feet). The back ground is also lightly chalked. Add some pop dots and all done! A simple and sweet card. Bonus card! This is one of the new patterns in our latest cardmaking book, Wishes! The outer part of the card is like an open envelope and the insert (with pink swirls on the sides) pulls in and out. I love how interactive this one is! The greenish-blue color is Juniper (the patterned Juniper paper is from Perfect Day) and the blush pink is from That's Amore. 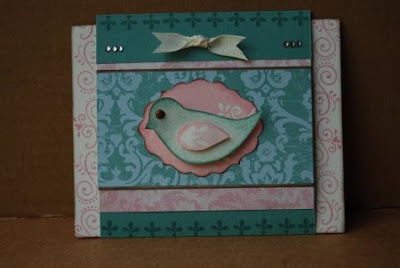 The sweet little bird is from Bird Basics and is sitting on a blush Tender Tag highlighted with Cocoa edges. A couple of sparkles from a Connection Club Reward and we have one "tweet" little card! I guess I had a bird thing going this month - must be all that wonderful sunshine thats been coming my way! Now "Hop" on over to Pamela O'Connor's Blog to see her work! Be sure to visit all the Consultants at their Blogs to get some great ideas! Remember, the June SOTM is only available until June 30th! Contact your CTMH Consultant (or click here) to see how you can get this stamp set at a discount or even FREE! Got lost? No worries! Pick the blog hop back up by following this list of participating consultants! Happy Hopping! How clever! I love how you used the tags in this card. So cute! Trees! Wowsers...topiary trees at that. Totally unexpected use of the tags and FUN! Brilliant! Love the topiaries! Thanks for hopping with us! You are just too dang clever! Love it! Brilliant! Very outside of the box and I love it! That has to be the most creative use of the tags I have seen! Love the topiary trees! I agree that is the most creative card I have seen, Very nice! OMG these are fantastic. It is taking me a long time to visit everyone's blog and I vowed not to leave any more comments, but....I can't help myself, I just love these. 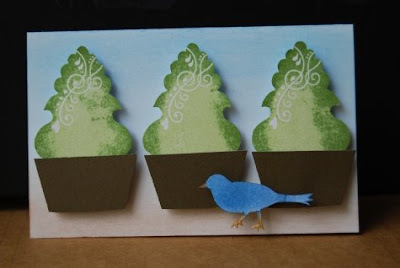 Your topiary bird card is so stinkin' creative! TFS!!!!!! These are too stinkin cute!!!!!! Great job! I love how you used the stamps. Too fun!! Oh GOODNESS! Love the cards. Awww, (blushing) - thanks for the compliments! I'd best get working on July's hop so I don't disappoint!